We were approached in 2016 by all acclaimed director Manfred Schweigkofler, from Illuminata, to collaborate on a very special Carmina Burana production to perform in Lubljana, Slovenia. He wanted a very special Carmina, not seen till now. So we wanted to bring Carmina to another level.The opera was a double opera, since it was made up of Ksenja ( an original Slovenian popolar opera ) and a Carmina Burana. It was not easy to connect the two operas with a unique connected narrative and even visually it was a challenge since even the music where so different. 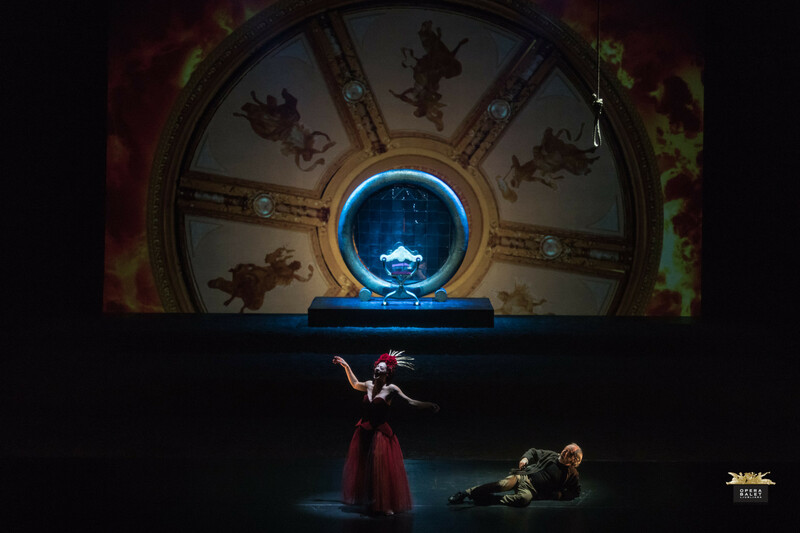 We made all sceneries of this opera through the technique of Videomapping and all the work was done to perform in the jewel theater of SNG Opera in Balet of Ljubljana. We designed all the visual content for this Ksenja-Carmina Burana using several tools and tecniques mixing 2d and 3d workflows.The challenge was that we had to project on the architecture of theater plus a front projection on a tulle and a retro projection for a total of 4 beamers. Tools that where used to create all this content were Adobe package, Cinema 4d, Substance Painter, Turbulence FD, Real Flow and Resolume Arena 5. We developed therefore several moodboards and visual concepts following the guidelines of directors interpretation of the dual opera Ksenja-Carmina Burana. Afterwards we developed all sceneries through 3 months of preproduction and arrived to the theater for rehearsal, adapting the scenes to the architecture ( through the technique of Videomapping ), interaction with actors and Andrej Hajdinjak's lightdesign. It was definitely a great teamwork and really satisfying to see the passion that everyone involved put in the making of this work. Some stills from the Show. Photos courtesy of Darja Stravs from SNG Opera in Balet Ljubljana.